Namaskaar. We move on to Qualities of a Parabhakta enumerated in Verse #17 of Bhagavad Gita Chapter 12 and the lucid commentary of Pujya Swami Dayananda which is so enjoyable to read. Qualities in Verses #18-19 to follow in next post/s. Yah na hrsyati, the one who does not get elated when his desires are fulfilled. Namaskaar. After the Introductions to the Upanishads and also the author of this series Mr. V. Subrahmanian and the Advaita Academy, we now enter the study of the Upanishad proper. Its an advanced study of Advaita Vedanta and so its presumed that the reader already has sufficient exposure to the study of Vedanta through basic texts like Tattvabodha, and is familiar with the terms used therein. This series is just an introductory series and is in no way a substitute for learning from a Guru, which is essential for all of us to properly assimilate the teachings. I pray for the Grace of Isvara to be with us all so that we can benefit from this study. I am sure it will be a most enjoyable experience to get an exposure into the wonderful teachings of the Upanishads. HariH Om. V. Subrahmanian (Subbu) was born in 1956 in Bangalore, India, and graduated in Commerce and worked for the Reserve Bank of India, Bangalore until 1995. He was taught the Advaita Vedanta by a Jivanmukta Acharya, Prof. D.S. Subbaramaiya who taught Quantum Physics in the Central College, Bangalore. The Professor, himself having had training in Vedanta in the traditional manner, taught many aspirants who came to Him until His passing away in 1991. Visit V. Subrahmanian’s blog adbhutam.wordpress.com for more information about his work. 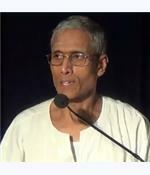 From today, Guru Purnima day 31st July 2015, we shall follow Upanishads commentaries of Shri V. Subrahmanian beginning with the Mundaka Upanishad. May Isvara guide us all. As Pujya Swamiji has said, there are many Upanishads, almost 108, but we students of Vedanta consider 10 of them as the ‘Principal Upanishads’ because Sri Adi Sankara wrote elaborate commentaries on these. We will therefore start our learning series with the Mundaka Upanishad. There is a very nice series of 17 articles / write ups on this Upanishad on the website http://advaita-academy.org by a very learned teacher of Vedanta Shri V. Subrahmanian who is one of the many prominent writers on that site. Advaita Academy is a School for Indian Spirituality & Philosophy set up by Creative India Academies for Art & Culture (CI). CI seeks to preserve and advance various facets of Indian Art and Culture including Spirituality & Philosophy, Visual & Performing arts, Design & Handicrafts, Cuisine, Health & Wellness and Language & Literature. — Live webcasts & recorded A/V talks by teachers from different sampradaya. — Articles & Blogs written by teachers and fellow seekers. 2. To offer online courses in Advaita Vedanta. I am grateful to Advaita Academy for permitting me to share all the articles and videos from their library for the benefit of fellow seekers. You may also visit their website http://advaita-academy.org and look up the study resources. There are many videos, articles and some very nice series of writeups on Vedanta. Namaskaar. In our series of Qualities of a Parabhakta enumerated in Verses #13-19 of the Bhagavad Gita we move on to Verse #16 and the wonderful set of Qualities with a superb commentary on each of these by Pujya Swami Dayananda. Namaskaar. We have completed the Qualities of a Parabhakta enumerated in Verses #13 and #14 of Chapter 12 of the Bhagavad Gita and here Pujya Swamiji winds up and explains why the Lord says after each verse that such a person is dear to Me. The further Qualities will be continued in Verse #15……. Namaskaar. We continue with description of further Qualities in this Part 7 of the series on Qualities of a Parabhakta with the beautiful and most easy to understand commentary of Pujya Swami Dayananda.